Owners, Alex Ball and Casey Emison, worked in the landscaping and property maintenance industry for 10 years before making the decision to open their own business. With so many combined years of experience, we are ready to take on any job with the enthusiasm and high level of competence we would expect from anyone working in our own yard. We pride ourselves on our ability to communicate with our clients which leads to a high level of customer service and satisfaction. It also allows us to offer a wide variety of services. 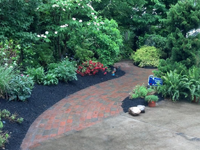 While we specialize in shrub, tree, and walkway maintenance, we can care for your total landscape—yeah, we do that! We go out of our way to utilizes only the highest quality of materials available. When you work with us, you'll not only expect the best, but you'll get the best. If you're looking for quality landscape maintenance services, contact Fine Line Property Maintenance today!